One chilly January morning a few years ago, we watched a young mink splashing about in the stream at the base of the canyon for an hour or two. In the winter, the young disperse and find their own digs, and this one was passing through on its way to a new territory. 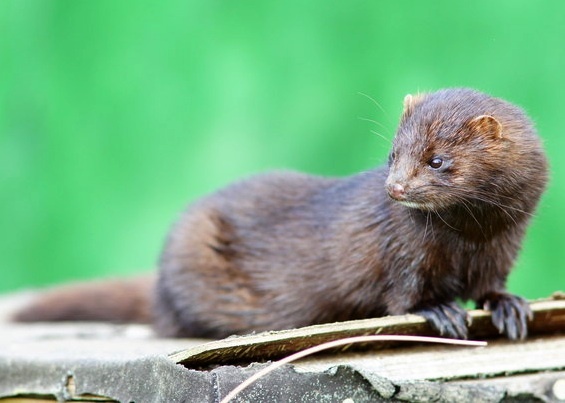 In recent years, we have noted several road killed minks, perhaps indicating an increase in their population. On the south border, our neighbor watched a young cougar bounding about in the grass seed field on an early autumn morning, another offspring of predators looking for new home range. 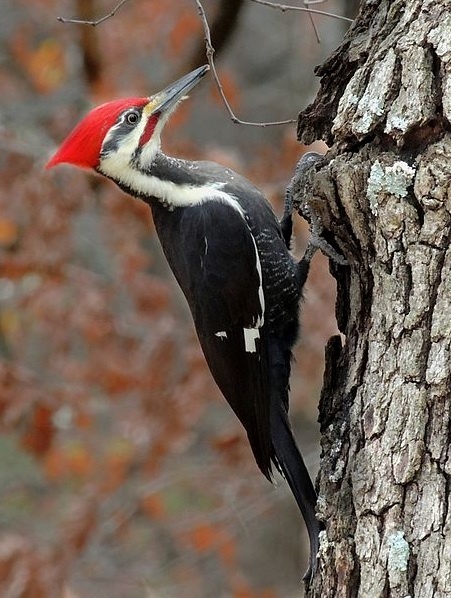 On occasion, we have watched pileated woodpeckers working some of our snags, but they are soon chased away by the acorn woodpeckers, earlier visitors who chose to stay and are intolerant of any other woodworking birds. 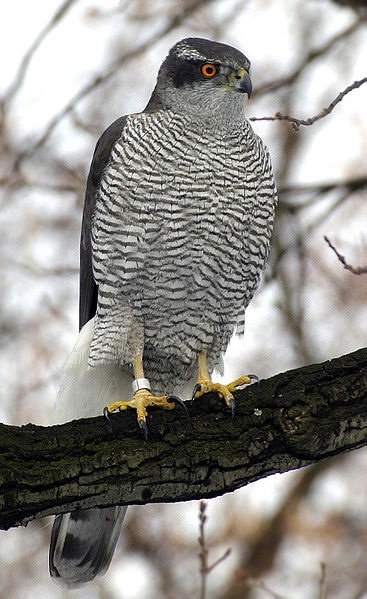 Their behavior changes when goshawks and Cooper's hawks pass through, using the residents of the oaks as a quick snack on the way to other places. The woodpeckers stay close to the trunks and communicate the location of the hawk in quiet, urgent calls. 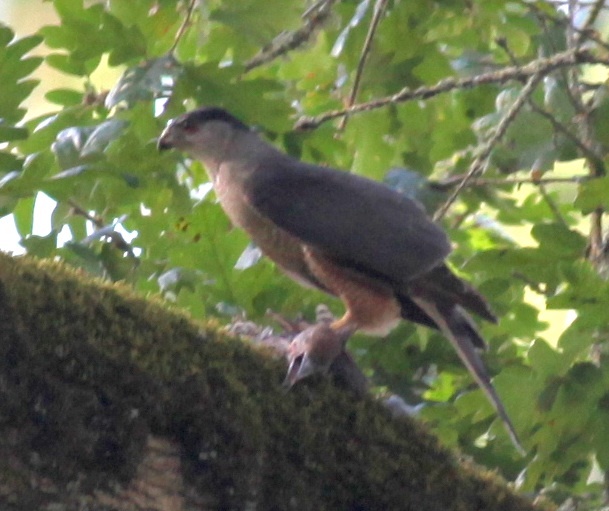 This September, a Cooper's hawk caught a flicker unawares, and we have photo of it with a lifeless flicker, beak agape, in its talons (top photo). The scene was as dramatic as any captured by Audubon but too gruesome for a full month, so it won't appear in this year's farm calendar. Some visitors pass through without us seeing them. The depressions made by hooves in soft soil tell us that a stag or bull elk passed through while we were sleeping. The bones and sinew of a deer's hind leg was found on the low ground, betraying another drama missed by us. Our farm is part of a bridge, or maybe a set of stepping stones is more apt, between the Coast Range and the Tualatin Ridge dominated by Bald Peak. Ecologists call these areas "wildlife corridors." Our approach to farming, with its rough fields and perennial crops, has enhanced the quality of the connection, providing creatures cover in their transit. It doesn't hurt that we provide a lot of great nesting habitat as well, thus having a few flickers to spare for the hawks. Peter and Pam Hayes of Hyla Woods share our affection for the natural components of the landscape. We have batted about the idea of a collaborative effort to link the farm and forest lands of the area. Working with Faye Yoshihara from the Food Front Cooperative board, Peter and Pam have proposed a loose collaboration called "Tualatin Headwaters: Producers in Partnership." The idea is to put together a gift package of Hyla Forest maple cutting boards, preserves from Ayers Creek and wine from Montinore Estate Vineyard. This will be the first step of a work in progress. We have a lot to figure out, but we are drawn to the project because we understand some our visitors were raised in forests flanking Mount Richmond that are carefully managed by the Hayes family. Maybe the Cooper's hawk we saw here nested on Mount Richmond and passed through the Marchesi family's vineyard feasting on a few robins or starlings. Anyway, we are part of Portland's backyard, and the waters from our lands flow through the city, so it will be fun open up a discussion about the connection we have with each other and the city.